Saturday morning worship services at One Homecoming underscored the contributions of healthcare professionals that often go unnoticed. Randy Roberts, DMin, vice president for spiritual life and mission, who delivered the sermon during the church service at Drayson Center, likened the work of humble people as extras in a movie—not famous stars, but most of the movement on screen, even if less noticed. “That’s most of us. Each of us is just one of the extras in the great story of God and in the more specific story of Loma Linda University,” Roberts told the audience of more than 1,000. The topic continued the theme from the Friday evening vespers service, which featured stories of several “Unsung Heroes.” The theme is one that illustrates the importance of small-town practitioners or missionaries who make a difference in the lives of patients they serve. They often are less noticed than well-known philanthropists and practitioners who have contributed to Loma Linda University in major, notable ways, Roberts said. From the start, the morning services focused on mission, both by alumni and current students. 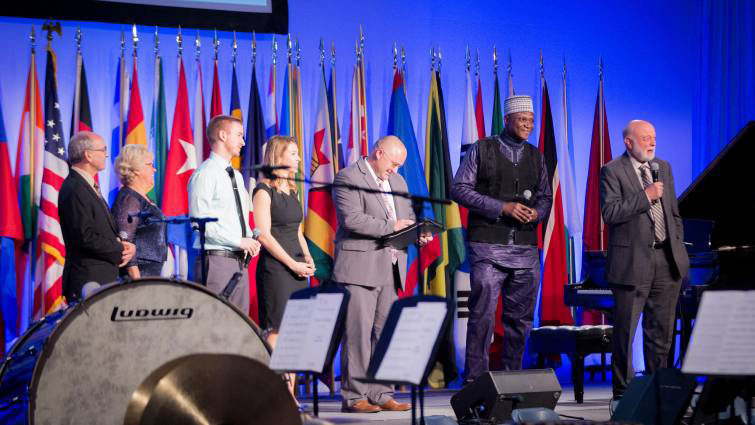 Richard Hart, MD, DrPH, president of Loma Linda University Health, introduced several alumni who have served in Africa, as well as students who have participated in mission trips. Dolores and Rollin Bland, who graduated from the School of Medicine in 1968, told of their service in Chad and their recent trips back to the North African country to help their daughter and son-in-law who now serve as missionaries there at Bere Adventist Hospital. Danjuma Daniel, who graduated from the School of Public Health in 2013, told of his upbringing in Jengre, Nigeria, where a mission trip last year brought dozens of students and practitioners to serve. A mission trip coming up in June will serve Bongo Adventist Hospital in Angola by rebuilding the facility, increasing operations and establishing outlying clinics. Emily Haus, who graduated from the School of Allied Health Professions in 2017, said she attended Loma Linda University largely because of its emphasis on mission and opportunities for overseas service. She and her husband Matt, who will graduate from the School of Allied Health Professions in June, have since participated in numerous trips. More than 600 students went on school-sponsored mission trips last year, and Hart said that number is expected to increase, thanks to the support of alumni who contribute to mission service. Hart said mission trips have traditionally been classified as extra-curricular activities but are now seen on campus as a key component of mainstream curriculum. He hopes that soon 20 percent or more of the student body will participate in mission trips. “We believe this is a significant part of creating the Loma Linda University experience that makes this all happen,” Hart said. This morning’s music was another reminder of the Loma Linda University Health’s diverse talents from its student body and staff. Music groups included the Loma Linda University Church Orchestra and Choir, Tad Worku, Lance Hundley, Stephanie Looi, Victoria Belliard, and the School of Allied Health Professions Signing Choir. The morning started with a Parade of Flags, with students and university staff walking up the aisle holding flags of nations from around the world.